Today was a day to tidy up some things on the “to do” list. 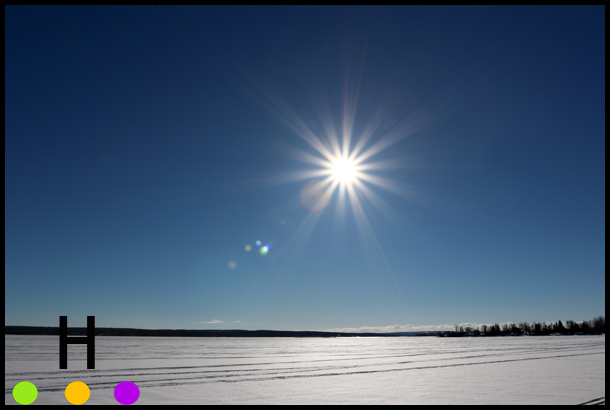 It is back to being cold outside (-20C with windchill….the wind is “not nice”), so it was easy to make the decision to stay in and get things done. 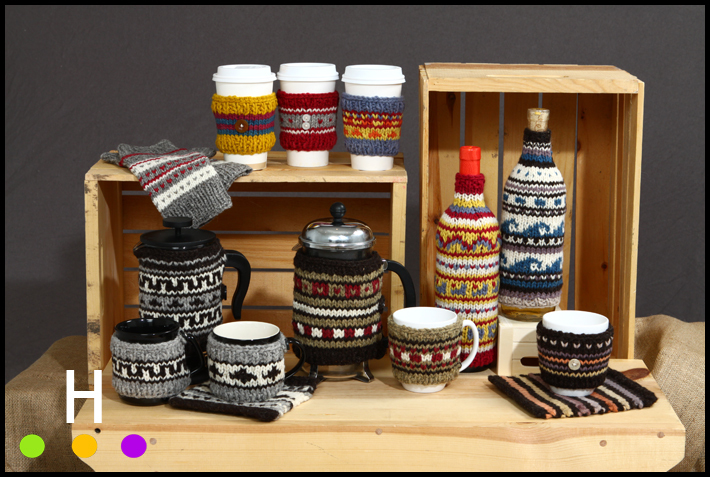 First project was to shoot a selection of the knit items completed recently. 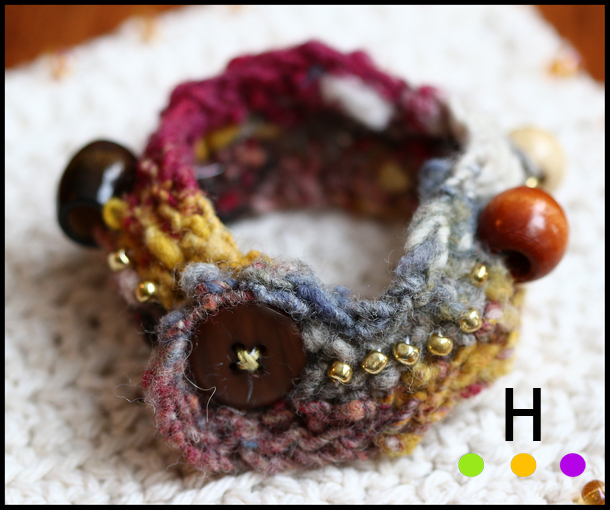 They are all hand knit of Canadian produced and milled wool that I hand dye in hand-crafted natural dyes. This image is for a project I am currently working on. 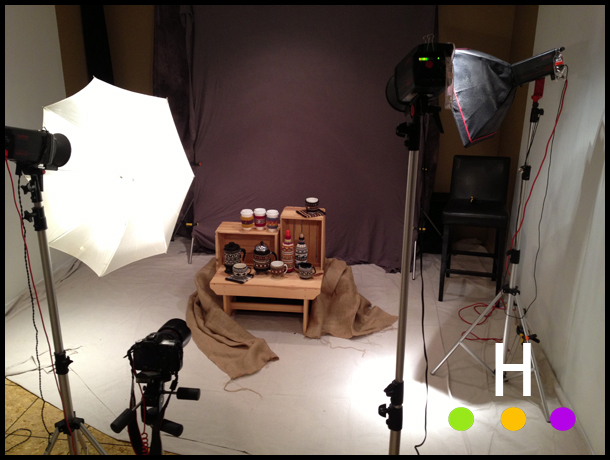 Just for fun, here is a quick iPhone shot of the pieces set up in the studio. The decluttered studio I might add; I like working in bare places. I am still toying with painting the studio, but it is a huge job. Of course I AM stuck at home for the next 3 days at least as our FOUR month old van is in the shop AGAIN, for the EIGHTH time (lost power when driving today….not good), so perhaps I should see it as an opportunity to paint the studio. Then again it is too cold to open windows for ventilation for the paint smell. Decisions, decisions. 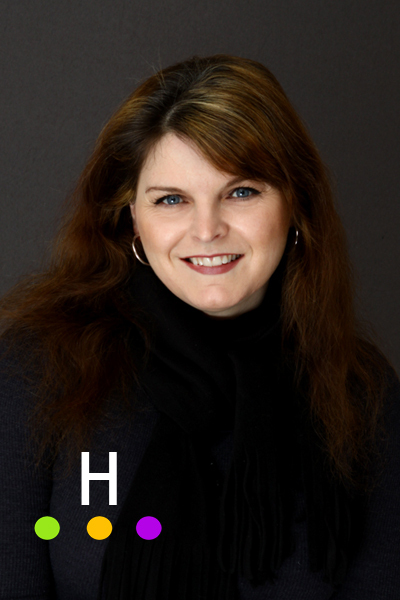 I also knocked off a quick self portrait head shot to update in my website. The last one was a couple of years old so it was time. 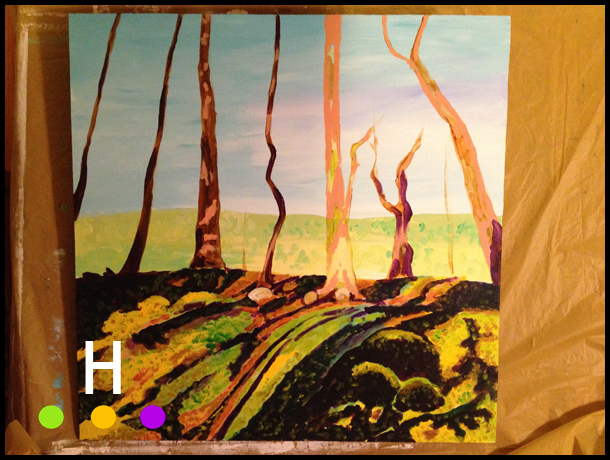 Another painting is also in progress, this one is 24″ by 24″. I joke that painting square is like painting Hasselblad. I have finished three paintings this size or larger in the last few weeks. I really need to post the finished pieces here, but naming paintings gets in the way. I was discussing with my husband my “naming” difficulty, and that I can’t very well name them “tree”, “tree#2”, and “another flippin’ tree” (hey, it’s a series! LOL! )…..my husband’s solution was to name the paintings “untitled”. Soooooo as you can see the whole family is “naming challenged” so it might be a while before a finished piece hits the blog. This evening I also did a bit more recycled spinning, and I might get some stitching done (rumor has it the new House of Cards is up on Netflicks………by the way, check out the version of House of Cards that Sesame Street did, it is priceless). We’ve finally taken the plunge. 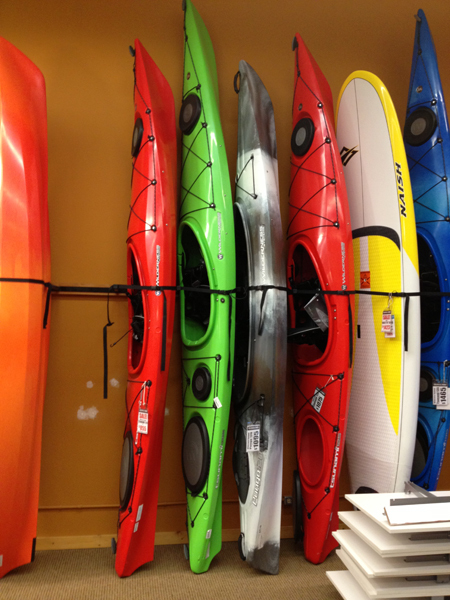 We’ve talked about picking up another kayak for quite a while. We’ve flipped through paddling magazines, watched for used boats on the coast, and drooled over the boats in the shops all winter long. 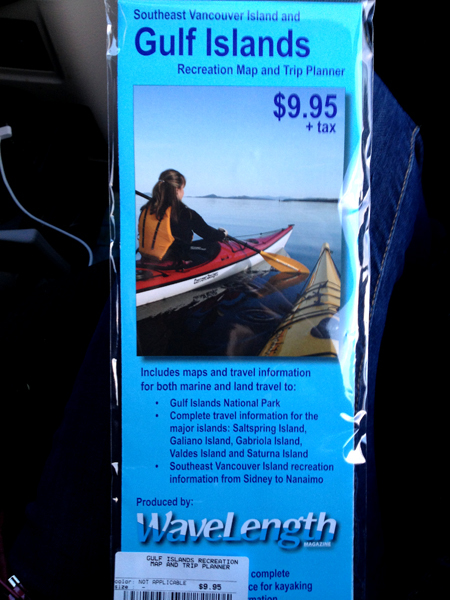 We’ve debated getting a cheap kayak for the kids, or getting a better boat for “us” (the grown-ups!) and letting them have our little boat. Today we just did it. 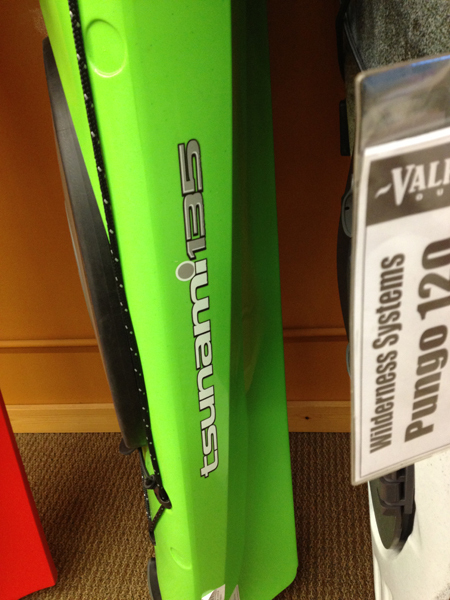 We walked into the store for another wistful look at the boats and there was a 13.5 foot boat on sale…quite on sale. The pretty green one is ours. We pick it up tomorrow. We’ll get to put it in the water in about a month. Kayaking isn’t on the minds of most in February, but we were actually paddling a week and a half ago out on the coast. Winter kayaking….best thing ever (beats shoveling snow!) Of course when we saw this map, we just had to have it too! Today’s blog post is brought to you by the LETTER S.
I thought I would put a Sesame Street spin on today’s blog post with the hope of adding some whimsy, as life in general isn’t feeling so whimsical. Saga – we are still dealing with the ongoing saga of our cabin and its damages. The way the whole situation has been dealt with has left me seething and quite honestly spiteful. Perhaps I am unreasonable in thinking people should be dealt with in a decent and professional manner. Now I am not one to sit around feeling sorry for themselves, sometimes it is just better to channel your energy into a solution, so last night I decided to create a site (website) which will help others to publicly out all the problems they are having dealing with the insurance industry. It is amazing what can be accomplished with four hours of time, five cups of tea and a lot of frustration from dealing with the insurance industry. The site is ready to go live, has interactive elements, plus I have worked out a way to make an income off it as well. One more unprofessional move by our insurance company is all it will take to set me off and then it will hit the good old world wide web. I feel happy having this in my arsenal….plus it has the potential to be a nice little business….funny how a bad insurance dealing can inspire you to create a business opportunity. 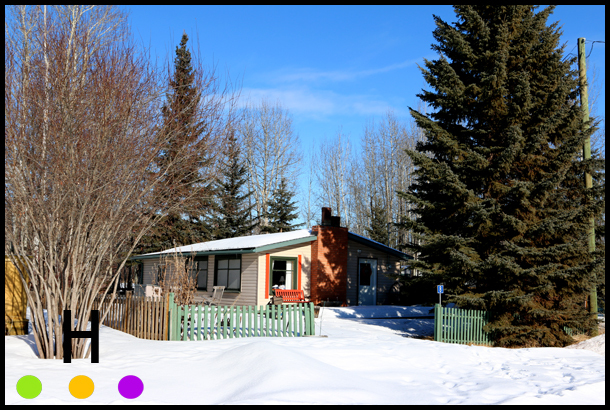 Shock – continuing with the cabin theme, today we had a shock….or potential shock. Remember my post from November ? Well the insurance company is looking at the cabin again. Different adjuster. Different contractors. They really looked this time at the situation which is a step forward. Today’s experience was professional. Now if you read my post from November you will remember me mentioning that we had to do our own exploration for insurance purposes, and an incident with tiles. Old tiles. I felt uncomfortable about the tiles in November, but now we are plain shocked. The tiles are being sent for asbestos testing. You don’t get a good feeling when people in masks are bagging a piece of tile for asbestos testing when just a few months ago you were picking the tiles up with your hands, not wearing masks and your children are sitting feet away from shattering tiles. This was part of the exploration we were told to do by the insurance industry. They’ve also told us to not do anything else in the cabin for now. So now on top of worry about the damage to the cabin, we get to worry about damage to our health; mine, my husband’s and our 5 children’s health. This is the nightmare that never ends. Snow – the one bonus today was we had the opportunity to view some lovely rural scenery that was crisply coated with snow. It is still deepish in spots, but not the insane amount of snow we had last year. Taking some snowy landscapes was one positive thing that happened today. 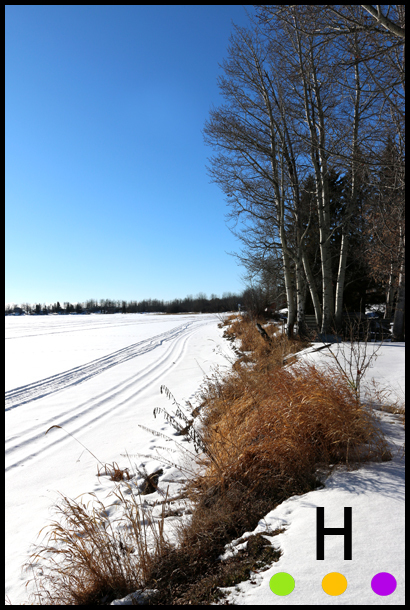 Shivering – yep, this morning en route to the cabin I checked the weather, -19C with windchill. 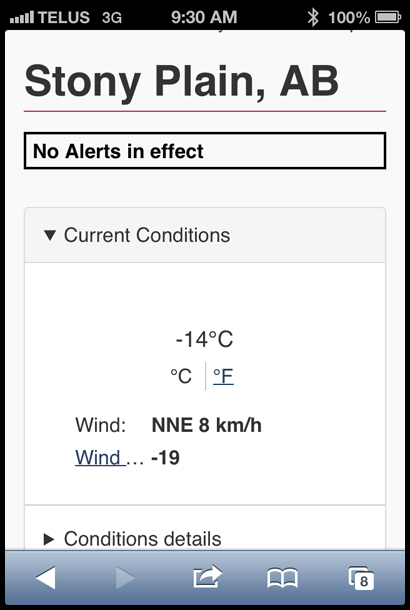 I checked it a little later in the day and it read -21C with windchill. Thank goodness the sun was out or it would have been brutal. The sun made all the difference. I will say the trip to the local outhouse was “crisp”. Shopping – our kids were hankering Ikea for supper so we detoured into Edmonton for a quick shop and supper. 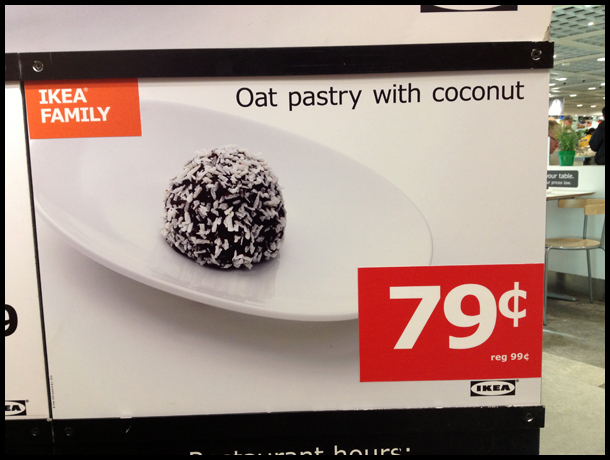 Everyone stopped in their tracks at the sight of the above picture of “Oat pastry with coconut”. Perhaps something was lost in translation, but there is nothing that makes me want to try an “oat pastry”. The picture didn’t sell its tastiness either. I am thinking there is a reason it is on sale! We did pick up a couple of items at Ikea and one of them was in the self-serve area. Now if you aren’t familiar with Ikea, they have these little cards and pencils so that you can write down the aisle that the product you need is in. Our seven year old was carrying the card and pencil and my husband told her the aisle number and asked her to write it down on the card. 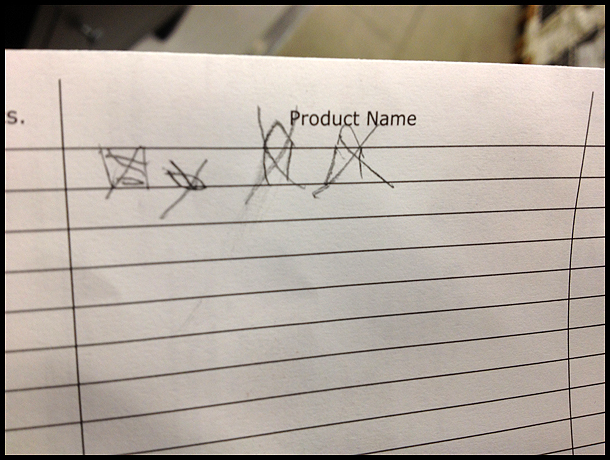 This was another event where something was lost in translation as she decided to DRAW the item. Looks just like Ikea’s instructions don’t you think?! Supper – we had Harvey’s burgers……………we just couldn’t get past the concept of “Oat pastry with coconut”. 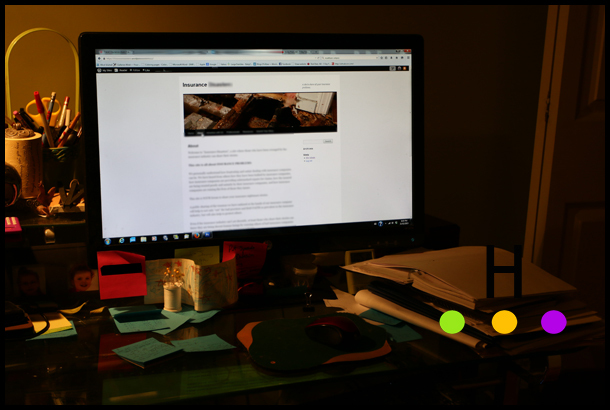 Thank you for reading my blog post brought to you by the LETTER S! I haven’t shared any portrait photography on this blog as of late, so I thought it would be nice to post a gallery of some outdoor portraits from the beaches of British Columbia. You can’t beat rocks and driftwood as a background. Such a beautiful location for shooting. Just one more woolly post (I promise!) and then I will get back to more varied blogging. 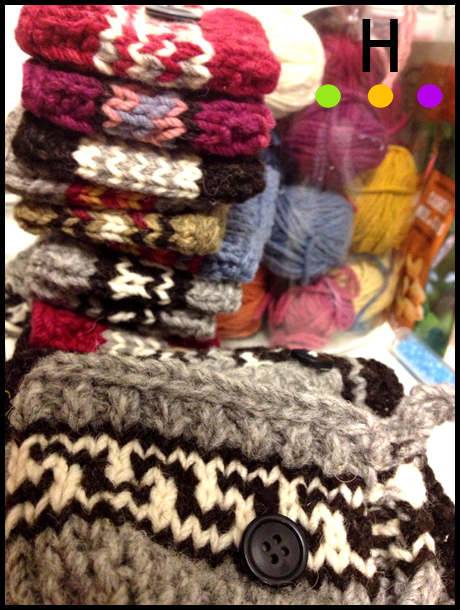 Today was a day of weaving in ends, choosing buttons, and sewing on buttons. The stack in the picture above was only part of what I tackled. I won’t share how long this whole process took (forever! ), the only good thing is it gave me an excuse to avoid reorganizing the studio (tomorrow’s dreaded chore!). I am amazed at how long it can take to choose the “right” black button; I swear I spent over an hour matching black buttons to different projects because all black buttons are not created equal. I still have eight pieces to finish up and then I can shoot the lot in the studio…….well after I reorganize it that is…….I’m avoiding the studio as I have 180 square feet of backdrop to iron. Fun. Not. As a reward for the endless weaving of ends I decided to tackle recycled spinning again. I divided up the scraps of yarn. Broke it down just a little this time, and mixed up the colors. And spun. This time it is spinning much faster, it is less finicky and breaking less. Now the question is, can I have a big ball of this ready to go by Saturday when I take my daughter to knitting group? 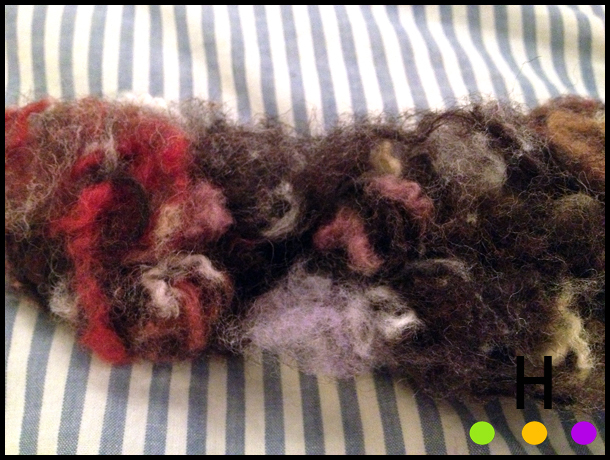 Last week I shared a post called “Spinning Scraps”. 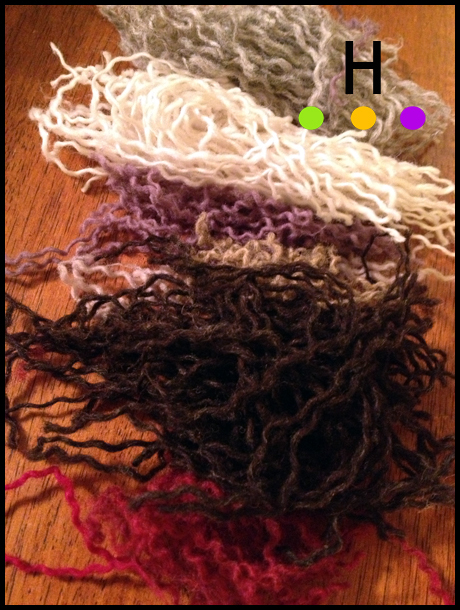 It was a post describing an idea I had of taking small yarn scraps and turning them into recycled and re-useable yarn. 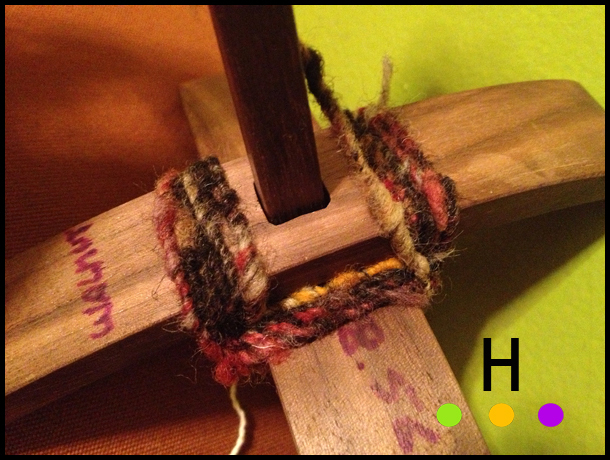 In short it involved breaking down the yarn and re-spinning it on a Turkish drop spindle at an incredibly slow pace. It was one of those things that I just had to see if it would work. Well it did work. The yarn formed on the spindle with all sorts of pretty mixed, naturally dyed colors, and I just had to see if the yarn could actually be turned into something. 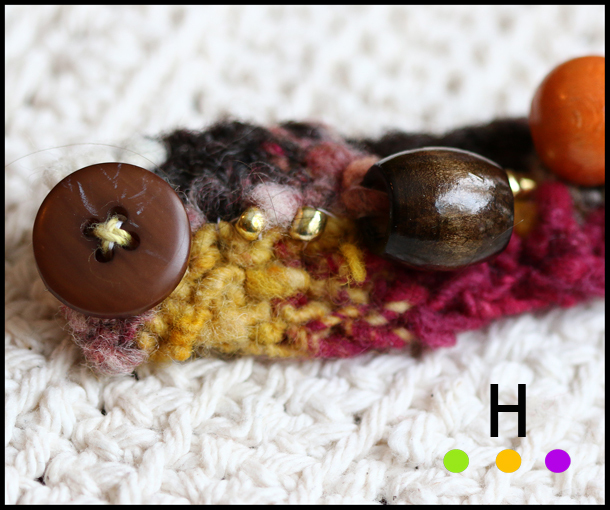 I decided on a quick project (because I was very impatient to see the results) and created a crocheted bracelet. To add to the earthiness I incorporated some wooden recycled beads bought at Nu To Yu on Pender Island (British Columbia, Canada). Every time we are on the island I hunt through the bins at the shop looking for treasures to incorporate into my projects. The button, used as a closure, is also one of my finds. This has been a fascinating project. 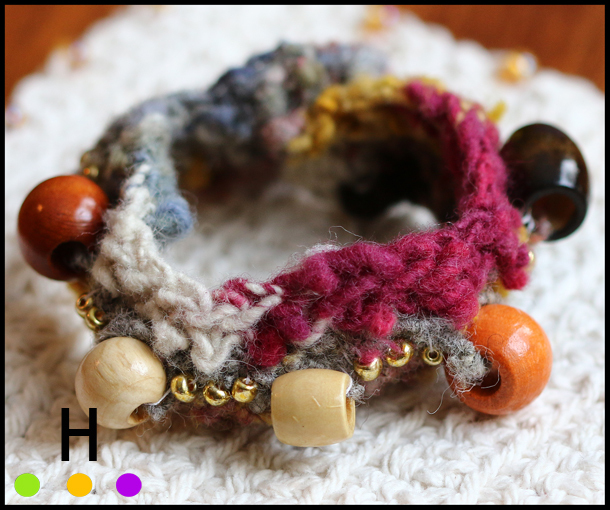 I am going to keep playing with the recycling of yarn, and perhaps try a larger knit or crocheted piece next. It is unpredictable, it is organic, it is eco friendly, and it is a pretty interesting way of working.